Long serving Cobblers club historian Frank Grande has been named the EFL League Two Supporter of the Year, after he was nominated by the club for the award. Grande, who is 70, has been a huge help to Northampton Town over many years. He has been the historian since the early 1980s, has also written many books on the club and contributed to the matchday programme for almost 40 years. Chairman Kelvin Thomas said: “We are delighted to learn of this award for Frank. “He has been a huge help and a big friend of the club over many decades and this is a wonderful tribute to Frank and his family and is much deserved. “We are really fortunate to have the support of some wonderful people at this club. 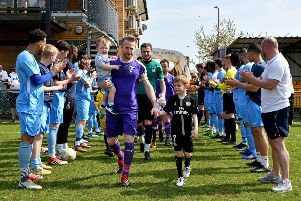 “This is the second year in succession our supporters have been recognised after Mustafa El-Bayati was named the EFL Supporter of the Year last year and that is a huge tribute to the individuals concerned. “It shows how much this club means to our supporters and how much those supporters mean to the club. The EFL Awards take place in London on Sunday, April 7.